Photo is for illustrative purposes only. Please see below for contents of kit. 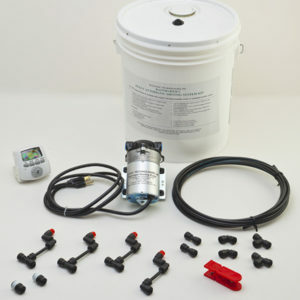 Featuring the original Rainmaker Series Misting System Kits! The very first Misting System Kits offered to the agricultural and zoological communities almost three decades ago and still a favorite today. Reasonably priced, easily installed and extremely versatile, this system is without a question the leading choice of professional herpetologists and horticulturists all around the world! 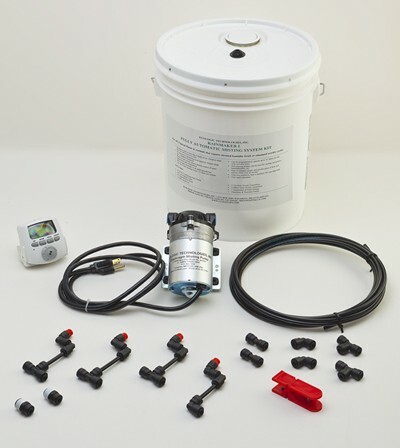 The original Rainmaker Misting System Kits. Still a favorite 20+ years later. Includes our 45 PSI diaphragm misting pump. Runs dry and is designed for intermittent or continuous duty. Mist a single enclosure or an entire greenhouse. Can be programmed to operate automatically up to 14 times per day for as little as 1 minute or as long as desired. 1/4″ I.D. hose size. 110V 50/60 HZ operation. 220V power converters available. Actual number of nozzles able to be used with this system will vary depending on many factors including type and number of nozzles used, corresponding flow rate, number and type of fittings, etc. But normally up to 35 or more of our red low flow wide angle nozzles and 80+ feet of 1/4″ I.D. 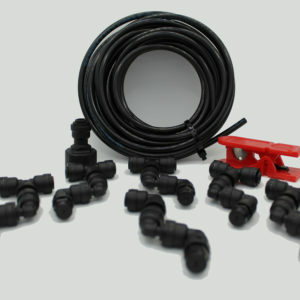 flexible hose can be operated on this system with no noticeable drop in performance. Regardless of which kit you choose, everything you need to get started is included.